HomeGeneralShine a light on Dupuytren? Dupuytren biology has a lot of overlap with wound healing biology. One description of Dupuytren is that it’s like the body is trying to heal a wound that isn’t there. I used to worry that any treatment described as “promoting” or “accelerating” wound healing might be exactly the wrong thing to do for Dupuytren or hypertrophic scars. This was based on the idea that scar biology in Dupuytren was excessive, healing “not wisely but too well”: bigger, faster – similar to muscle hypertrophy. It’s probably more that excessive scarring in Dupuytren is slow scarring, a delay in the transition from early stages of inflammation to the final stages of stability. If this is true, photobiomodulation may have the potential to correct this problem. Photobiomodulation is the current catch-all descriptive term for a light-induced biologic response, replacing a variety of older terms. The way photobiomodulation is thought to work has to do with how reflective color works. When light shines on a surface, some colors are absorbed into the material. The colors that aren’t absorbed reflect from the surface back to our eyes. That’s what determines the color we see. Each color of light has a specific wavelength and specific energy of its photons. When the energy levels of the light perfectly match the energy levels of some of the electrons in a molecule, these electrons absorb the light energy. When the energy is absorbed, it may be used for some biologic purpose, or change the molecule permanently, or leak back slowly, which is how glow-in-the-dark paint works. For this to happen, there has to be an exact match between a specific molecule and a specific color of light. 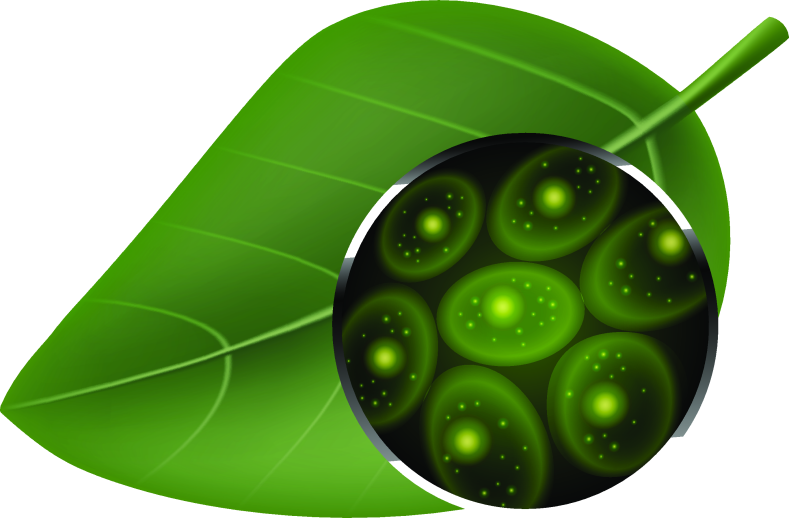 Chlorophyll is an example of photobiomodulation. Plants are green because chlorophyll molecules only absorb red and blue light but not green wavelengths which reflect back. Plants convert this energy to calories the same way we convert food to calories. That’s the reason some high-efficiency plant grow lights are only red and blue: those are the only colors chlorophyll absorbs. Plants can’t take in energy from green light precisely because plants are green. Vitamin D is another example. Our bodies manufacture a form of Vitamin D that doesn’t work. When ultraviolet light of the right wavelength (293 nanometers, invisible) passes through our skin, it is absorbed by specific electrons the inactive vitamin D molecules. These charged up electrons permanently rearrange their connections, which changes the molecule from the inactive form to the active form. Pretty cool, huh? The field has changed with the availability of high-power LED lights. The light source doesn’t have to be a laser. The only difference between laser and LED is that laser energy isn’t very affected by the distance between the source and the target, while LED energy drops off rapidly the further the source is from the target. What does this have to do with Dupuytren? Inflammation. The early stages of Dupuytren involve inflammation. Some people have Dupuytren nodules that are swollen, pink, itchy, or tender: classic effects of inflammation. Biologically, this is caused by immune cells in Dupuytren nodules called macrophages. There are different types of macrophages. M1 macrophages release inflammatory molecules. M2 macrophages release anti-inflammatory molecules. One thing that happens when a wound progresses through the stages of healing is that irritating M1 macrophages transform into calming M2 macrophages. When someone gets a cortisone shot into an inflamed Dupuytren nodule, it causes the M1 macrophages to do just this, which is why nodules respond to cortisone injections. This is where photobiomodulation might enter the picture. Photobiomodulation also induces M1 ⇒ M2 macrophage transition, which is why it has anti-inflammatory effects. The specific wavelength sweet spots for this effect may center around 660nm (this color) and 830nm (near infrared; invisible). There’s no useful Dupuytren data – yet. There is no research on light therapy involving for Dupuytren patients. The first Dupuytren-specific publication on photobiomodulation was just published in 2019. This reviewed the effects of 453nm blue light (this color) on Dupuytren cells grown in the lab https://dupuytrens.org/DupPDFs/2019_Krassovka.pdf. The reported mechanism of action was on the Dupuytren fibroblast cells (not macrophages), shining the light on cells growing in a Petri dish. The logistics challenge is that blue light doesn’t penetrate the skin far enough to make it down to the level of nodules: https://dupuytrens.org/DupPDFs/2017_Ash.pdf. Very exciting, but time will tell. What could possibly go wrong? Overall, light therapy is considered safe. Light therapy is commonly used by therapists with the intent of reducing inflammation. Consumer light therapy products are available for online purchase from sites such as https://tendlite.com and https://joovv.com/. However, the effects of light therapy on the immune system need to be better understood. Inflammation is an immune process. Macrophages are immune cells. Immune cells fight bad things, like infections and cancers. This is why medicines which suppress the immune system can increase the risk of some infections and cancers. One study concluded that light therapy might have prevented the immune system from fighting a type of aggressive thyroid cancer: https://dupuytrens.org/DupPDFs/2016_Rhee.pdf. This clearly needs further research. We’re working on a study to document the short-term effect of light therapy on Dupuytren nodules. This will be interesting, but won’t answer the question of whether or not light therapy has the potential to change the long-term risk of Dupuytren progression. One of the more intriguing findings in this research is that the effects of local light therapy of injured areas can be measured in the blood: https://dupuytrens.org/DupPDFs/2014_Kuboyama.pdf. This fits perfectly with the International Dupuytren Data Bank research to identify Dupuytren-related biomarkers in a blood test. Such a test could be used to quickly measure and compare the effects of different light therapy protocols rather than having to wait years to see whether or not they worked. Very exciting! Disclaimer: The Dupuytren Research Group has no relationship or financial interest with Tendlite, Joovv, or any other light therapy product or vendor.